Successfully Added 2 DIN Car Stereo - For Toyota Corolla, 9 Inch Display, Android 8.0.1, GPS, WiFi, 3G&4G Support, CAN BUS, Octa-Core CPU, 4GB RAM to your Shopping Cart. 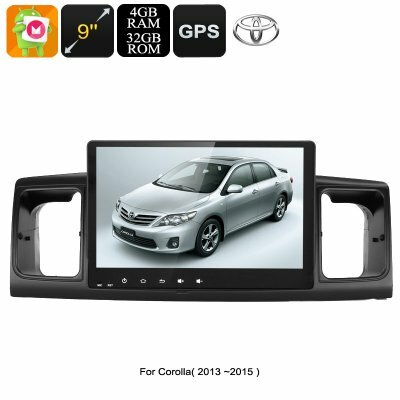 Upgrade your Toyota Corolla (Model 2013 – 2015) car stereo with this 2 DIN Android media player. By supporting regular FM and AM radio frequencies, this car stereo offers you with a great way to enjoy the latest songs and talk shows. Additionally, it also treats you with Bluetooth connectivity. This does not only allow you to listen to the songs stored on your smartphone, but also lets you engage in hands-free phone calls. From now on, you’ll always be able to listen to the tracks of your liking and stay connected to friends and family while driving your car. With its beautiful 9-Inch Display, this two DIN car media player provides you with an easy way to browse through all its features. Unlike a regular car stereo, this car accessory runs on an Android operating system. This means that you’ll be able to do so much more than simply listening to songs. From now on, your passengers can enjoy movies in crisp 1024x600p HD resolution straight from your dashboard. Additionally, they have access to the Play Store. This means that they’ll be able to download Applications and games that can be enjoyed during upcoming road trips. All your favorite films and series can be inserted through the intergraded USB and SD-card slots. Additionally, you’ll be able to download or stream media straight from the web. Thanks to its WiFi and 3G dongle (not included) support, this dual DIN car media player allows you to browse the web straight from your dashboard. This brings along great entertainment possibilities while simultaneously providing you with great connectivity. With its Octa-Core CPU and 4GB RAM, you can be assured that this car gadget can handle all basic Android features available on today’s market. This car stereo brings along a highly accurate 20-channel GPS navigation system. With this feature at your side, you can be guaranteed that you’ll never get lost again. Whether you’re simply driving around the neighborhood or traveling abroad, with this car navigator you’ll always reach your destination. From now on, you’ll no longer have to worry about bringing along those annoying maps or getting lost on the way. This takes away plenty of annoyance and makes sure that you’ll be able to enjoy your upcoming road trips to their absolute most.